A cross section of WSLHD staff attended the workshops at Westmead and Blacktown hospitals. 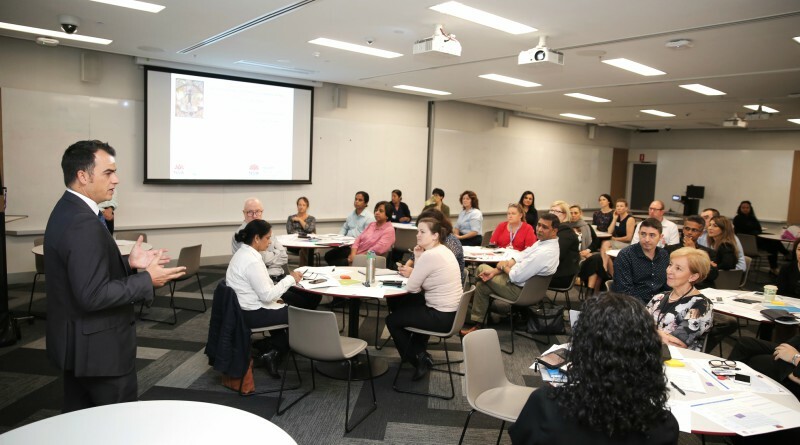 Hosted by Western Sydney Local Health District (WSLHD), Clinical Governance director Luke Sloane was delighted with the representation and volume of attendees. “Clinical Governance has an important role in the organisation – this is to partner with clinical service teams to drive improvement in patient safety and quality of care across the District, in accordance with the WSLHD safety and quality improvement strategies and the NSW Health Patient Safety and Clinical Quality Program,” Luke said. “We provide healthcare to more than one million residents each year and each patient deserves to receive quality care. “This is achieved by a dedicated team of 13,000 individuals who work across 70 sites including Westmead, Auburn, Cumberland, Blacktown and Mount Druitt hospitals as well as a network of comprehensive integrated care and community based services. “We depend and rely on strong leadership and communications from our staff to develop and implement improvement programs and District wide projects across WSLHD, across a wide range of clinical governance initiatives and projects, to improve patient safety and quality of care and clinical governance within WSLHD. “Ian Richards and Sarah Lyons from the Clinical Excellence Commission facilitated the workshops to help ascertain the effectiveness of clinical governance across the district. “The workshop will help us gain a better understanding of strengths, development needs and ideas for action to ensure the best safe and high quality service for our patients and consumers,” Luke said. The Clinical Excellence Commission team will now produce a report with their findings and recommendations on how to enhance clinical governance and support the implementation of new clinical governance framework, which aims to improve understanding of clinical governance and the improvement framework within our organisation. For further information about the workshop or the role of Clinical Governance, email Bernadette.Wykes@health.nsw.gov.au or 8890 9924. Parramatta North project – what does it mean for Cumberland?